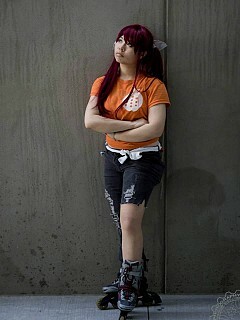 I'd been wanting to do an Air Gear cosplay for a long time (since I started attempting rollerblading stunts). And now 2014, I finally had time to finish Ringo. I'd altered a pair of jeans and sewed+dyed+painted (the apple) that t-shirt. The wig is probably the longest wig I've had. And the rollerblades I've had forever. 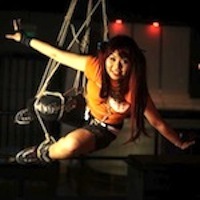 This shoot that I debuted this cosplay was super mega awesome though. Most AG cosplayers only get to attempt jumping stunts, but I managed to get a photoshoot with someone who hoisted me up in climbing gear. So thus this was the /coolest/ photoshoot I ever did with the most /challenging/ poses ever. I also really loved the makeup and post-processing work I did to it. 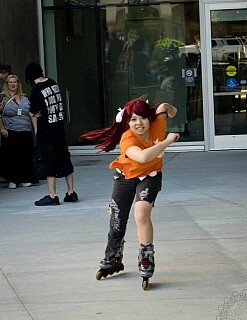 I also wore her to Fanime 2014 and did a couple normal skating photos.